How can you get rid of moss all over a lawn? This is likely caused by highly compacted soil. It is not allowing water to drain properly, which is causing mosses and algae to grow. 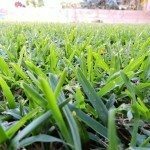 You will have to aerate the yard, and reseed with some new grass. This will make it hard for anything but the grass to grow, since they will outcrowd most other plants.